Readers' note: This is the first in a series of profiles for the candidates vying for Gresham City Council position 4. Benjamin Jones wants to make a difference in the world. Even though the 40-year-old is busy starting a family and going to school, he has his sights set on a bid for Gresham City Council position 4 to continue supporting the community he has fallen in love with. Jones has lived in Gresham for two years after residing in Troutdale and Tigard. While pursuing a further degree at Portland State University in biology, he is also working for Amazon delivering packages, which has allowed him to explore new areas of the city and meet with people from all walks of life. Those experiences of hearing about the needs of his community spurred him to throw his hat into the ring for local politics. Though he has never served in an elected government position before, he does have experience serving on boards. 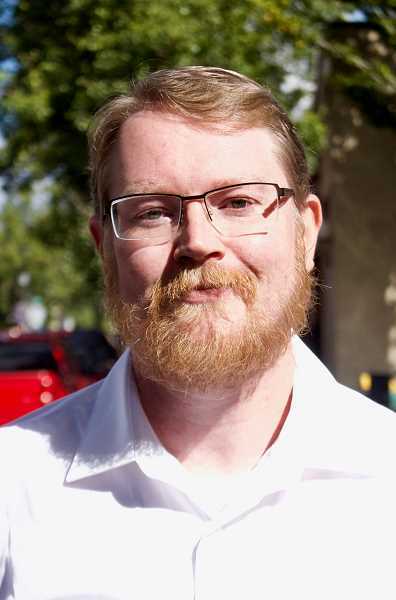 Jones is currently the leader of a local Neighborhood Watch group for his condominium, and was treasurer of a Beard and Mustache charitable club when he lived in Sacramento. THE OUTLOOK: Why are you running? BENJAMIN JONES: Council seems like a good place to try to make a difference and learn about the city — I also thought about school board. All great political figures in America started small, and all I want to do is leave something positive behind. JONES: We need to scale city and county resources. My brother just moved from Troutdale to east Gresham, and he told me his water bill doubled in monthly cost. I want to figure out why that is. Congestion on the city streets, trying to keep up with infrastructure, and homelessness and housing are all important. Drug use is all over right now. I was delivering packages and seeing people living on the streets and used needles on the ground in public areas was troubling. We need to look at what we can do to at least understand the problems better. Climate change is also in the news, and affects everyone. My father and mother-in-law have a condominium in Florida close to the water, and they aren't sure how long the beach will last before being flooded. We need to look at the impact we can make locally. Where do we buy our energy? Is it sustainable, carbon-neutral? We need to look into it and find out. OUTLOOK: What would you change in Gresham? JONES: What I have heard most is the issue of homelessness. It impacts everyone and our public spaces. Mental health is a huge issue in this country. I come from a military family, and it breaks my heart to see so many people who lose their livelihoods and can't find a job when they get out of the military. It doesn't need to end in suicide, or with veterans living on the streets. One of my friends, a former marine, has had nothing but struggles to find what she needs. Homelessness and mental health are hand-in-hand these days, and it is a huge mountain we have to climb. JONES: I imagine all five (of the candidates) are at least equally as passionate about what they bring to the table. Until I do more research on them I couldn't tell you what sets me apart — other than my desire and belief I can represent people here in Gresham whether I believe in the same things they believe in. I am empathetic and sympathetic — I can put myself in their shoes and see things from their perspective. OUTLOOK: Would you change how the city operates? JONES: I want to spend some time attending council meetings. I haven't had an opportunity yet. Negotiating the websites of government is frankly terrible. Every page on the website for the county and the city of Gresham looks exactly the same. I would love to see if anyone in the departments could help us update the websites with better links and make it more navigable. OUTLOOK: Why should the voters choose you? JONES: I didn't do this as a spur of the moment thing, I have been talking about it for most of my adult life. There had never been a good time before, or a good place, but now I feel invested in this city. I bought a home in this city, I'm raising my son in this city, and my wife and I will grow old in this city. I will bring more passion and more time to this job than others will be able to.